Mary Wollstonecraft Shelley (née Godwin; 30 August 1797 – 1 February 1851) was an English novelist, short story writer, dramatist, essayist, biographer, and travel writer, best known for her Gothic novel Frankenstein; or, The Modern Prometheus (1818). She also edited and promoted the works of her husband, the Romantic poet and philosopher Percy Bysshe Shelley. Her father was the political philosopher William Godwin, and her mother was the philosopher and feminist Mary Wollstonecraft. After Wollstonecraft's death less than a month after her daughter Mary was born, Mary was raised by Godwin, who was able to provide his daughter with a rich, if informal, education, encouraging her to adhere to his own anarchist political theories. When Mary was four, her father married a neighbour, with whom, as her stepmother, Mary came to have a troubled relationship. For the romance film, see Mary Shelley (film). Mary Wollstonecraft Shelley (née Godwin; 30 August 1797 – 1 February 1851) was an English novelist, short story writer, dramatist, essayist, biographer, and travel writer, best known for her Gothic novel Frankenstein; or, The Modern Prometheus (1818). She also edited and promoted the works of her husband, the Romantic poet and philosopher Percy Bysshe Shelley. Her father was the political philosopher William Godwin, and her mother was the philosopher and feminist Mary Wollstonecraft. Mary Shelley was born Mary Wollstonecraft Godwin in Somers Town, London, in 1797. She was the second child of the feminist philosopher, educator, and writer Mary Wollstonecraft, and the first child of the philosopher, novelist, and journalist William Godwin. Wollstonecraft died of puerperal fever shortly after Mary was born. Godwin was left to bring up Mary, along with her older half-sister, Fanny Imlay, Wollstonecraft's child by the American speculator Gilbert Imlay. A year after Wollstonecraft's death, Godwin published his Memoirs of the Author of A Vindication of the Rights of Woman (1798), which he intended as a sincere and compassionate tribute. However, because the Memoirs revealed Wollstonecraft's affairs and her illegitimate child, they were seen as shocking. Mary Godwin read these memoirs and her mother's books, and was brought up to cherish her mother's memory. Mary's earliest years were happy, judging from the letters of William Godwin's housekeeper and nurse, Louisa Jones. But Godwin was often deeply in debt; feeling that he could not raise the children by himself, he cast about for a second wife. In December 1801, he married Mary Jane Clairmont, a well-educated woman with two young children of her own—Charles and Claire. [note 1] Most of Godwin’s friends disliked his new wife, describing her as quick-tempered and quarrelsome;[note 2] but Godwin was devoted to her, and the marriage was a success. Mary Godwin, on the other hand, came to detest her stepmother. William Godwin's 19th-century biographer Charles Kegan Paul later suggested that Mrs Godwin had favoured her own children over those of Mary Wollstonecraft. In June 1812, Mary's father sent her to stay with the dissenting family of the radical William Baxter, near Dundee, Scotland. To Baxter, he wrote, "I am anxious that she should be brought up ... like a philosopher, even like a cynic." Scholars have speculated that she may have been sent away for her health, to remove her from the seamy side of business, or to introduce her to radical politics. Mary Godwin revelled in the spacious surroundings of Baxter's house and in the companionship of his four daughters, and she returned north in the summer of 1813 for a further stay of 10 months. In the 1831 introduction to Frankenstein, she recalled: "I wrote then—but in a most common-place style. It was beneath the trees of the grounds belonging to our house, or on the bleak sides of the woodless mountains near, that my true compositions, the airy flights of my imagination, were born and fostered." Mary and Percy began meeting each other secretly at Mary Wollstonecraft's grave in St Pancras Churchyard, and they fell in love—she was nearly 17, he nearly 22. 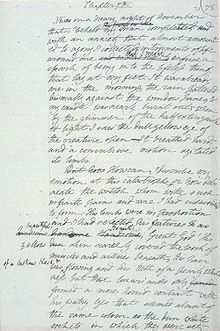 On 26 June 1814, Shelley and Godwin declared their love for one another as Shelley announced he could not hide his "ardent passion", leading her in a "sublime and rapturous moment" to say she felt the same way; on either that day or the next, Godwin lost her virginity to Shelley, which tradition claims happened in the cemetery. Godwin described herself as attracted to Shelley's "wild, intellectual, unearthly looks". To Mary's dismay, her father disapproved, and tried to thwart the relationship and salvage the "spotless fame" of his daughter. At about the same time, Mary's father learned of Shelley's inability to pay off the father's debts. Mary, who later wrote of "my excessive and romantic attachment to my father", was confused. She saw Percy Shelley as an embodiment of her parents' liberal and reformist ideas of the 1790s, particularly Godwin's view that marriage was a repressive monopoly, which he had argued in his 1793 edition of Political Justice but since retracted. On 28 July 1814, the couple eloped and secretly left for France, taking Mary's stepsister, Claire Clairmont, with them, but leaving Percy's pregnant wife behind. After convincing Mary Jane Godwin, who had pursued them to Calais, that they did not wish to return, the trio travelled to Paris, and then, by donkey, mule, carriage, and foot, through a France recently ravaged by war, to Switzerland. "It was acting in a novel, being an incarnate romance," Mary Shelley recalled in 1826. Godwin wrote about France in 1814: "The distress of the inhabitants, whose houses had been burned, their cattle killed and all their wealth destroyed, has given a sting to my detestation of war...". As they travelled, Mary and Percy read works by Mary Wollstonecraft and others, kept a joint journal, and continued their own writing. At Lucerne, lack of money forced the three to turn back. They travelled down the Rhine and by land to the Dutch port of Marsluys, arriving at Gravesend, Kent, on 13 September 1814. She began writing what she assumed would be a short story. With Percy Shelley's encouragement, she expanded this tale into her first novel, Frankenstein; or, The Modern Prometheus, published in 1818. She later described that summer in Switzerland as the moment "when I first stepped out from childhood into life". 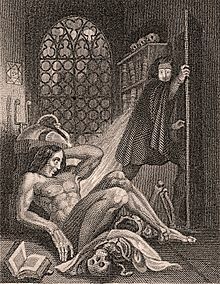 The story of the writing of Frankenstein has been fictionalised several times and formed the basis for a number of films. Shelley and her husband collaborated on the story but the extent of Percy’s contribution to the novel is unknown and has been argued over by readers and critics. 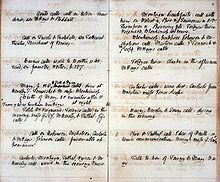 There are differences in the 1818, 1823 and 1831 editions and Mary Shelley wrote, "I certainly did not owe the suggestion of one incident, nor scarcely of one train of feeling, to my husband, and yet but for his incitement, it would never have taken the form in which it was presented to the world." She wrote that the preface to the first edition was Percy's work "as far as I can recollect." James Rieger concluded Percy's "assistance at every point in the book's manufacture was so extensive that one hardly knows whether to regard him as editor or minor collaborator", while Anne K. Mellor later argued Percy only "made many technical corrections and several times clarified the narrative and thematic continuity of the text." Charles E. Robinson, editor of a facsimile edition of the Frankenstein manuscripts, concluded that Percy's contributions to the book "were no more than what most publishers' editors have provided new (or old) authors or, in fact, what colleagues have provided to each other after reading each other's works in progress." After leaving Naples, the Shelleys settled in Rome, the city where her husband wrote where "the meanest streets were strewed with truncated columns, broken capitals...and sparkling fragments of granite or porphyry...The voice of dead time, in still vibrations, is breathed from these dumb things, animated and glorified as they were by man". Rome inspired her to begin writing the unfinished novel Valerius, the Reanimated Roman, where the eponymous hero resists the decay of Rome and the machinations of "superstitious" Catholicism. The writing of her novel was broken off when her son William died of malaria. Shelley bitterly commented that she had come to Italy to improve her husband's health, and instead the Italian climate had just killed her two children, leading her to write: "May you my dear Marianne never know what it is to lose two only and lovely children in one year-to watch their dying moments-and then at last to be left childless and forever miserable". To deal with her grief, Shelley wrote the novella The Fields of Fancy, which became Matilda dealing with a young woman whose beauty inspired incestuous love in her father, who ultimately commits suicide to stop himself from acting on his passion for his daughter, while she spends the rest of her life full of despair about "the unnatural love I had inspired". The novella offered a feminist critique of a patriarchal society as Matilda is punished in the afterlife though she did nothing to encourage her father's feelings. Shelley continued to practice her mother's feminist principles by extending aid to women whom society disapproved of. For instance, Shelley extend financial aid to Mary Diana Dods, a single mother and illegitimate herself who appears to have been a lesbian and gave her the new identity of Walter Sholto Douglas, husband of her lover Isabel Robinson. Shelley also assisted Georgiana Paul, a woman disallowed for by her husband for alleged adultery. Shelley in her diary about her assistance to the latter: "I do not make a boast-I do not say aloud-behold my generosity and greatness of mind-for in truth it is simple justice I perform-and so I am still reviled for being worldly". Shelley frequently wrote stories to accompany prepared illustrations for gift books, such as this one, which accompanied "Transformation" in the 1830 The Keepsake. Despite the emotions stirred by this task, Mary Shelley arguably proved herself in many respects a professional and scholarly editor. Working from Percy's messy, sometimes indecipherable, notebooks, she attempted to form a chronology for his writings, and she included poems, such as Epipsychidion, addressed to Emilia Viviani, which she would rather have left out. She was forced, however, into several compromises, and, as Blumberg notes, "modern critics have found fault with the edition and claim variously that she miscopied, misinterpreted, purposely obscured, and attempted to turn the poet into something he was not". According to Wolfson, Donald Reiman, a modern editor of Percy Bysshe Shelley's works, still refers to Mary Shelley's editions, while acknowledging that her editing style belongs "to an age of editing when the aim was not to establish accurate texts and scholarly apparatus but to present a full record of a writer's career for the general reader". In principle, Mary Shelley believed in publishing every last word of her husband's work; but she found herself obliged to omit certain passages, either by pressure from her publisher, Edward Moxon, or in deference to public propriety. For example, she removed the atheistic passages from Queen Mab for the first edition. 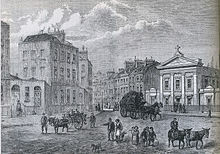 After she restored them in the second edition, Moxon was prosecuted and convicted of blasphemous libel, though the prosecution was brought out of principle by the Chartist publisher Henry Hetherington, and no punishment was sought. Mary Shelley's omissions provoked criticism, often stinging, from members of Percy Shelley's former circle, and reviewers accused her of, among other things, indiscriminate inclusions. Her notes have nevertheless remained an essential source for the study of Percy Shelley's work. As Bennett explains, "biographers and critics agree that Mary Shelley's commitment to bring Shelley the notice she believed his works merited was the single, major force that established Shelley's reputation during a period when he almost certainly would have faded from public view". ↑ Bridgwater, Patrick (2004). De Quincey's Gothic Masquerade. Rodopi. p. 55. ISBN 978-9042018136. ↑ Quoted in Seymour, 233. 1 2 3 Garrett, 55. ↑ Seymour, 467–68; Blumberg, 165–66; Townsend, 362. Jones, Steven. "Charles E. Robinson, Ed. The Frankenstein Notebooks: A Facsimile Edition of Mary Shelley's Novel, 1816–17 (Parts One and Two)". (Book Review). Romantic Circles website, 1 January 1998. Retrieved 15 September 2016. Robinson, Charles E., ed. The Frankenstein Notebooks: A Facsimile Edition of Mary Shelley's Novel, 1816–17 (Parts One and Two). The Manuscripts of the Younger Romantics, Volume IX, Donald H. Reiman, general ed. Garland Publishing, 1996. ISBN 0-8153-1608-9. Townsend, William C. Modern State Trials. London: Longman, Brown, Green and Longmans, 1850. Richard Holmes, "Out of Control" (review of Mary Shelley, Frankenstein, Or, The Modern Prometheus: Annotated for Scientists, Engineers, and Creators of All Kinds, edited by David H. Guston, Ed Finn, and Jason Scott Robert, MIT Press, 277 pp. ; and Mary Shelley, The New Annotated Frankenstein, edited and with a foreword and notes by Leslie S. Klinger, Liveright, 352 pp. ), The New York Review of Books, vol. LXIV, no. 20 (21 December 2017), pp.38, 40–41.